Today, still the baby brother of big-city airports, it has virtually zoomed out of its swaddling clothes. Already the field has surpassed all of its older rivals. More passengers arrive or depart on its far-flung runways than on any other of the world’s many airports. During the noon rush period, an air liner lands or takes off every fifty-six seconds. In the blue, above its broad, brown acres, the last generation’s fantastic dreamâ€”of a sky actually dotted with giant planes sparkling in the sunâ€”has become this generation’s accomplished fact. So jammed is this busiest cross-roads of the clouds with the huge, sleek silver birds of the air lines alone that a figurative “keep off the concrete” sign has been hung out for all other aircraft in the form of a special landing fee. Even Uncle Sam’s army and navy planes have taken the hint to stay away unless on important and official business. Between 5:00 and 6:15 p. m. daily, more than fifty scheduled air liners come or go. An average of more than 290 air liners alone land or take off daily and the total has hit 359 on a holiday. Without restrictions, these figures would double and perhaps treble on a field already so lively that occasionally there is just enough room on the concrete loading apron for the scheduled transport ships, crawling in and out like gargantuan beetles. Sometimes, when low visibility hampers operations, ten or fifteen liners drone in monotonous circles at 1,000-foot intervals above the field awaiting permission to descend in turn, and land. So quickly has this infant airport fulfilled the vision of its creators that a move was started to establish a number of branch airports north of New York City and across the Hudson in New Jersey so that passengers might be shuttled back and forth in small, fast ships to relieve congestion of the 558-acre fledgling field. Originally the brain child of Mayor Fiorello H. La Guardia, the airport’s activities have grown with amazing rapidity, thanks to the keen perception of the executives who direct the operations of the major air lines â€” American, United, T.W.A., Eastern, Canadian Colonial and Pan American. Everyone saw the convenience angle of an airport centrally located within the largest city in America, with its time-saving advantages. But these men spotted one more factor that would give aviation itself a tremendous boost and they did not hesitate to offer the support which made the field practical. Because the airport is surrounded by the densely populated city, it is almost impossible for a plane to use the field without passing over a crowded section of the metropolitan district. The result has been that each great ship that wings its way to and from the field is writing a story of speed and safety across the sky where all can see. Thousands who would not have thought of flying a year ago, have become accustomed to the idea. They are among the new patrons of passenger aviation. Proof of the advertising value of the location is the fact that more than one million visitors have paid a dime each merely to enter upon a platform skirting the loading apron to watch the air liners arrive and depart. To manage this great stream of air traffic, an organization of more than 4,000 persons has grown up, enough to populate a good-sized town. Like a town, too, the airport has restaurants, bars, a florist, barber shop, newsstands, fire equipment, weather bureau, first-aid stations, telegraph offices, a photographer and a post office. In addition, being a port of entry for Pan American’s air passengers from Portugal, The Azores and Bermuda and Canadian Colonial’s from Canada, it has U.S. customs, immigration and health offices. Spearhead of the management groups is a force of some fifty men under the direction of Commissioner John McKenzie, Major Elmer Haslett and Chief Engineer Joseph A. Meehan representing the city’s control of the terminal. This staff includes the twelve men who stand day and night vigil in the control room in a tower atop the administration building, the chattering and humming room which functions as the brain and nerve center of the airport, as well as its ears and eyes, co-ordinating the efforts of the air-line executives and Uncle Sam’s Civil Aeronautics Board to keep things unsnarled. Using every practical device common to airport control towers the world over, including more than $30,000 worth of radio equipment alone, these traffic cops of the “Grand Central Terminal” of aviation bring the air liners down when they are within reach of the field, or dispatch them from the airport confines, whereupon their flights become the business of the flight superintendents of the individual air lines and the CAA Airway Traffic Control. In daylight, these men depend largely upon their virtually unobstructed view of the field and its approaches. At night, however, they are aided by a clever electric mechanism which reproduces the field in miniature and reveals the passage of planes on the runways by lights that flash on and off as the aircraft trip the controls. The towermen deliver radio instructions to the pilots in the adjacent air or, awaiting the word to lift their ships, giving permission to land, taxi or take off. Just as mechanically complex and precise are the individual communications systems of the air lines, which follow7 the flight captains and co-pilots from one field to another, never letting go until a local airport control takes over at Washington, Chicago, Los Angeles, San Francisco or some other distant terminal. American Airlines centers its communications, largest privately owned system of its kind in the world, at La Guardia Field where more than $50,000 in radio equipment includes four transmitters in the area ten miles south of the field, and ten receivers on a near-by island. Even before a departing plane is out of sight of the airport, practically every station on the American Airlines routes knows it is in the air. The flagships report at intervals of about half an hour on weather, altitude and position. Teletypewriters crisscross the nation with messages fixing the positions of flagships in flight. A novel chart registers American flights scheduled for a given day. Instead of a flat map, the device is a three-dimensional chart of transparent plastic material through which separate vari-colored ribbons follow each scheduled route. At the top it resembles a system map of American Airlines. Down the sides are lettered the hours of the day. 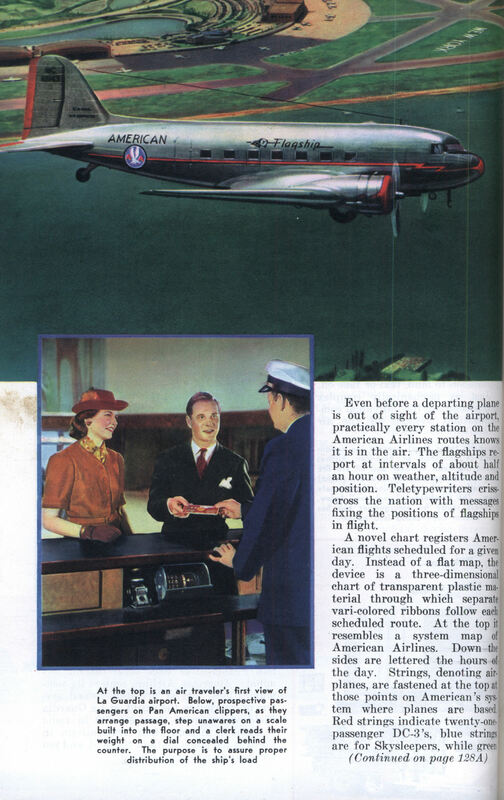 Strings, denoting airplanes, are fastened at the top at those points on American’s system where planes are based, Red strings indicate twenty-one-passenger DC-3’s, blue string are for Skysleepers, while green strings indicate fourteen-passenger day planes. The various strings trace the movements of the flagships from their base stations to various destinations according to the schedule of operations at a given time. TWA has an ingenious and concentrated control unit about the size of an office switchboard which performs around 300 separate electrical tasks. In addition to six transmitters and seven receivers near the field, TWA has two auxiliary transmitters at Newark. United, Eastern, Canadian Colonial and Pan American all have their individual facilities. Aside from the elaborate radio set-up, landing and take-off are rendered comparatively simple and definitely foolproof by lights and a network of four broad, white runways ranging in length from 3,500 to 6,000 feet and from 150 to 200 feet in width, one of which is in line with the field’s directional beam, permitting blind landings by instruments. These runways are connected with each other and the International Terminal or seaplane base which is a part of the field, by a web of intersecting concrete strips so arranged that the craft may speed into the particular runway made most desirable by the current winds. The lights are a scientific accomplishment in themselves and their number and power may be judged by the fact that they consume enough kilowatts to illuminate 600 or 700 miles of city streets. Above the control tower is the most powerful airport beacon in the United States, a shaft delivering 13,500,000 candlepower and revolving six times a minute. Together with most of the thousands of red, green, blue, white and yellow bulbs, this beacon is operated from the control tower. Many lights, however, are self-operating, like the four large red globes which warn night fliers of a 125-foot standpipe two miles from the field. An electric-eye device turns on these lights outlining the hazard at the approach of darkness or on the descent of a thick fog. In daylight and in clear weather, it switches the circuit off. Also it keeps a record of everything it does. Lines of red neon lights stretching 3,000 feet on posts point the way toward the runway which divides the field southwest by northeast, enabling a pilot to orient himself. An electric “sock” in the shape of an arrow, strung with red bulbs, gives him wind direction at night and automatically registers its findings in the control room. The apron is banked with powerful floodlights, taxi lights guide a plane on ground to the proper runway and the field itself is rimmed by eighty-five boundary globes, hooked up on two circuits so that failure of one set of alternate lights would leave the others burning. The hangars, seven for land planes and one for seaplanes, each larger than Madison Square Garden and big enough to hold a football game, crowd and all, are brilliantly lighted and each contributes illumination to the near-by portion of the field. Often far into the night in these structuresâ€”so gigantic they have twenty-five-ton doorsâ€”overalled crews groom the liners for their journeys. 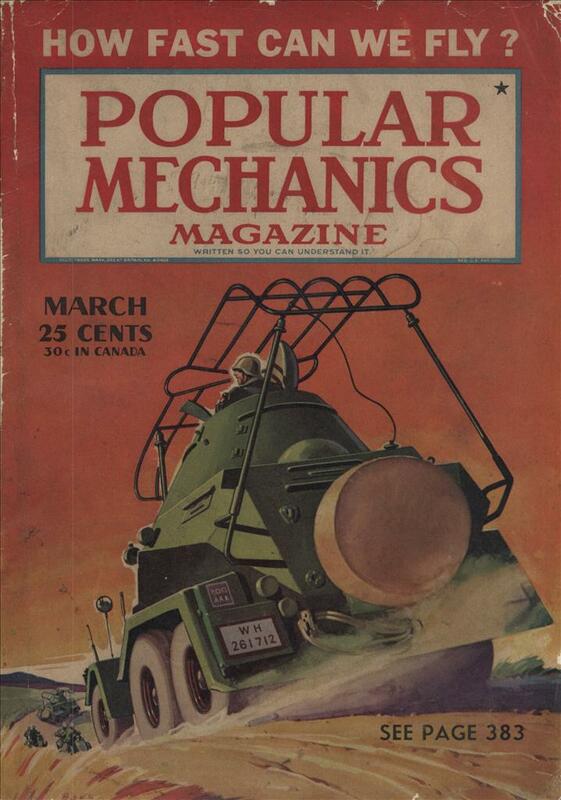 There are half a dozen or more mechanics for each man who flies, and in addition there are radio wizards, propeller experts, brake specialists, instrument repairmen, painters, carpenters, upholsterers and a host of other men who keep the ships in shape. In these hangars and the offices of the metropolitan airport is a community of workers with almost a single interest, aviation. They talk it, study it, practice itâ€” almost all thinking beyond their job, puzzling out an angle that will advance the cause of their avocation. Their general aim, according to Chief Engineer Meehan, is to leave nothing to the human mind that can be done by a mechanism. Hundreds of devices are thought up and tested; like Pan American’s concealed scales which tattle on fat people without their knowledge while they are chatting with a clerk; like the thermocouple unit which takes the temperature of a motor and reveals its ailment; like the stethoscope which counts an engine’s heart beats, or the “bump-o-graph” which registers the turbulence of the air during flight, or the magnetic flux machine which reveals metal faults too small for the eye to see. Each is contributing toward the advancement of flight. None, however, is likely to equal the bright idea of setting a huge flying field right down in the middle of a great city so that airplanes could become as familiar to cliff dwellers as are birds to a farmer. Wonderful post. A real airport. I visit your sight every day. Thank you. I was interested to come across this pamphlet online–my grandfather was John Mckenzie, the Commissioner of Docks under Mayor LaGuardia mentioned above. My grandmother saved every newspaper clipping and original photo that featured my grandfather during his years as Commisioner. I believe this booklet is among those archives as well.